The AX2020 is a continuous conduction mode inductive step-down converter, designed for driving single or multiple series connected LED efficiently from a voltage source higher than the total LED chain voltage. The device operates from an input supply between 8V and 32V and provides an externally adjustable output current of up to 1A. Depending upon the supply voltage and external components, the AX2020 can provide more than 15 watts of output power. The AX2020 includes the power switch and a high-side output current sensing circuit, which uses an external resistor to set the nominal average output current, and a dedicated DIM input accepts a wide range of pulsed dimming. 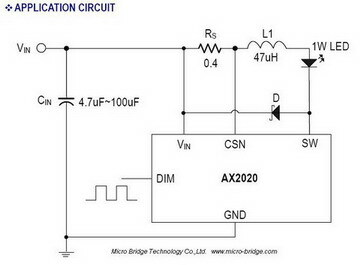 Applying a voltage of 0.3V or lower to the DIM pin turns the output off and switches the device into a low current standby state.The AX2020 is available in SOT89-5L package.